Grab a glass of this magic potion to boost yourself with the much-needed energy this summer. Muskmelon delight with its high levels of Vitamin A is a great immune booster and is an ultimate healing juice. It is also a potent antioxidant that helps prevent cancer, delay ageing, and promote greater concentration and vision. 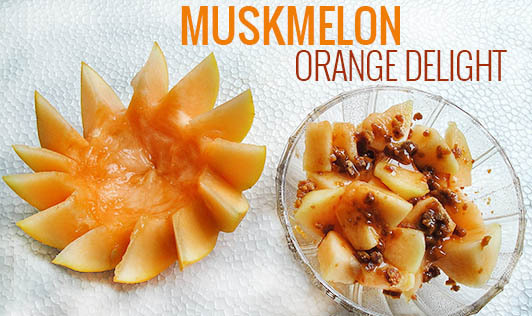 • Peel and chop the muskmelon into small pieces. • Peel and separate the orange into segments. • Finely chop the parsley. • Blend all the ingredients together, except lemon juice and parsley, (using little water if required) until smooth. • Strain the juice using a muslin cloth. • Add lime juice and stir well. • Add the chopped parsley and mix well. • Add some crushed ice to 2 glasses and pour the juice over it. • Juice the fruits separately. • Add chopped parsley and mix.